Technicolor Kitchen - English version: Amaretto butter cakes + "Argo"
Years ago I watched a good movie called “Gone Baby Gone” which to my surprise had been directed by Mr. Ben Affleck; he’d never been one of my favorite actors, but since I’d been pleased with his directorial debut and had also liked his performance in “Hollywoodland” I thought that watching “The Town” was mandatory – and what a great film that turned out to be, with an insanely good performance by Jeremy Renner, an actor I like a lot (and those who think of him just as Hawkeye should watch this movie, “North Country” and “The Hurt Locker”). The awards season starts soon and I would be very glad to see “Argo” receive the recognition it deserves – and I hope Affleck continues to work as a director for many years to come. Ever since using Amaretto in baking for the first time I’ve been looking for excuses to do it again and again: I’ve used it to replace almond extract a couple of times with really good results and it goes well with chocolate, too. That is why I was so curious about these cakes and they did not disappoint: you can really feel the liqueur flavor in them and they are very tender, with a crunchy touch given by the almonds. They’re delicious plain, with no icing at all – and especially moreish still warm from the oven – but I wanted more Amaretto flavor and topped them with a simple glaze made with the liqueur. Preheat the oven to 180°C/350°F. Butter and flour twelve 1/3-cup capacity brioche or muffin pans. In the large bowl of an electric mixer, cream butter and sugar until light and fluffy. Add the eggs, one at a time, followed by the yolk – beat well after each addition and scrape the sides of the bowl. Beat in the Amaretto and vanilla. At low speed, alternately add the dry ingredients and the sour cream, beginning and ending with the dry ingredients. Fold in the almonds. Divide the batter among the prepared pans. Bake for 20-25 minutes or until risen and golden and a skewer inserted in the center comes out clean. Cool in the pans for 2 minutes then unmold onto a wire rack – do not wait longer than that or the cakes might stick. Cool completely. Glaze: sift the confectioners’ sugar into a small bowl. Add the Amaretto and mix to combine. Gradually add the water and stir until desired consistency. Pour icing over cakes. Set aside until set, about 20 minutes. Those butter cakes look so good and I LOVED Gone Baby Gone! I also really loved Argo...although I have to admit I did not realize it starred Ben Affleck until the credits rolled! I am so bad at identifying actors. :) Those little cakes look fantastic! 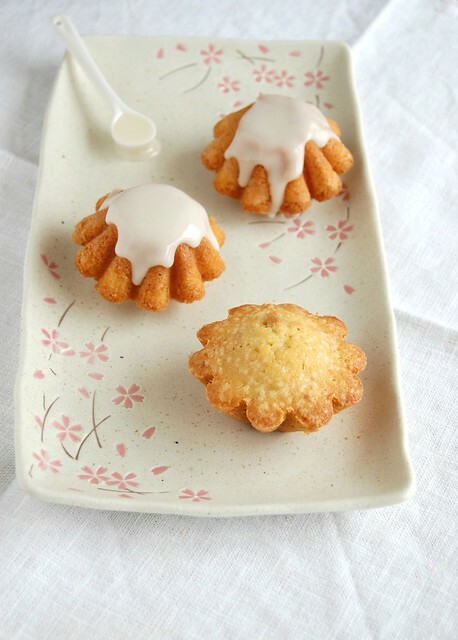 Gorgeous little butter cakes, I love the amaretto glaze!